Catalog Home > Brewer Classroom Management Kit, It's In the Box! The Classroom Management - It's in the Box! This kit saves teachers time by providing start up materials and a reference guide which assists teachers in developing an optimal learning environment for the young child. The Brewer kit includes quality materials that will last for many school years. (available in English or Spanish). This Kit includes the following: Name Chart: A child's name is the most important word in his world. This name chart offers opportunities for the children to interact with their names while allowing teachers the ability to change the name chart as the classroom roll changes. Letter Wall : The letter wall helps children work with letters while developing thematic vocabulary through meaningful print. Children's Literature about Names: This beautiful storybook comes with a lesson plan to help teachers introduce the letter wall by using children's names. Transition Book: Transitions take up about 33% of the day. This transition book comes with activities for attention getting, moving children from activity to activity, and time fillers. The instructional skill is noted for each transition activity. 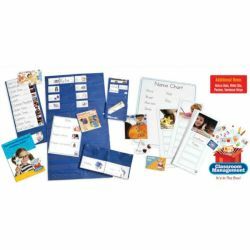 Center Signs: The center signs provide an organized strategy to help children independently choose and work in centers. Children's Literature About Respect of Self and Others: This beautifully illustrated book comes with a lesson plan to help introduce the concept of respect through the Rules Chart and Helper Chart. Rules Chart: The rules chart helps the teacher create a positive classroom community where children know the expectations. Helper Chart: A job for each child continues to build a classroom community where everyone has an important role. Attendance Chart: As children move their name from home to school, they are involved in a routine that helps them transition into the school day. This chart also provides opportunities to perform number operations through counting and comparing. Daily Schedule: Children are more secure when they know what to expect. The Daily Schedule helps children move throughout the day comfortably while also providing meaningful print about the sequence of the day. Survey of the Day: This activity provides a morning routine for children as they enter the classroom. It also gives children the opportunity to "act like a reader" while engaging in data collection and analysis. Pocket Charts also included in kit.